It's important to find a happy balance between the kind of work that is done on a regular, weekly basis and those sorts of pieces which require much more time to complete. I always like to have a few pieces underway that are quite different from the mainstream of my daily work. Often, these will be handbuilt pieces which explore a new form idea and break away from the roundness of wheel work. The winter months are quiet and slow paced around here and they are a particularly good time to work on handbuilt pieces, as well as do glaze research, create new stamps and press moulds. This handbuilt stoneware jar was wood fired. It stands about 27 cm high. Exciting surfaces are possible with high temperature wood firing. As the flame travels through the kiln, it carries small bits of wood ash from the firebox. The wood ash is made up of minerals that interact chemically at high temperatures with the clay and glazes of the pottery. The ash lands on the shoulders of pots and if thick enough actually melts to form a glaze in its own right. 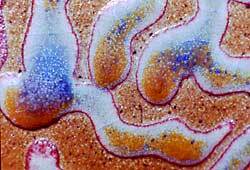 On the sides of pots it causes blushes of colour depending on the flame patterns. 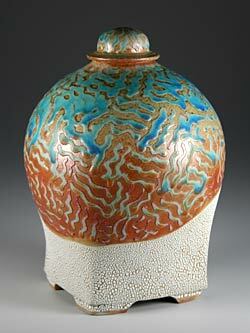 In the case of this piece, the lower part of the pot was glazed with a textured white glaze. 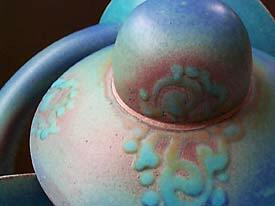 The upper part had a trailed copper glaze that usually gives a turquoise colour. In the wood firing however, variations in the thickness of the glaze and its orientation to the passing wood ash has dramatically transformed the glaze so that it shows dark blue, turquoise, light green, raspberry red and a rare copper orange. This jar is a combination of hand building and thrown parts. 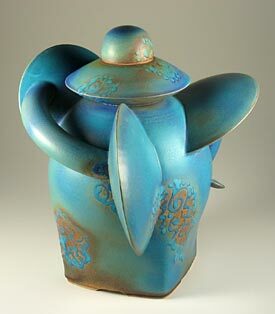 The lid, the curving tubes and the main body of the piece were thrown on the wheel. The disks and the squared base were hand built. The assemblage of this piece was like making a three dimensional collage. The disks and thrown tube were made ahead of time. Once the main body of the piece was made it became a design problem to assemble the various parts into a unified whole. This vase measures 32 cm tall, by 37 cm wide. 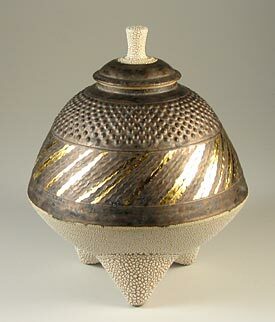 It was made with a combination of wheel throwing and handbuilding, and it's part of a series called phase transitions. 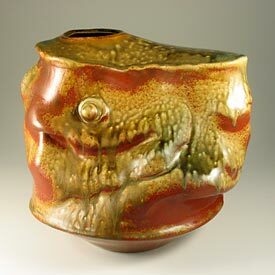 It has an iron red base glaze, with a generous amount of wood ash glaze over top. This large jar stands about 31 cm tall. It was made in a two part press mould. The texture on the jar is in positive relief, picked up from the interior of the mould, and a post firing application of gold leaf has been used. The white glaze has a beaded texture.